“There’s no place like home.” Dorothy was the first to say it, but we’ve all repeated her quote when we experience that good-to-be-home-feeling. And, that is exactly why Kansas is wonderful; it feels like home whether you live here or not. Maybe it’s the endless wheat fields with a promise of homebaked bread or the sea of grassland dotted with wild sunflowers. Maybe it’s geography. Kansas is our continental center and the nation’s heartland. Maybe it’s the early settlers’ pioneering spirit that endures in the state’s current generation. Whatever it is, we can all agree that Dorothy was right. So, why not come to Kansas for a visit? We have identified 10 experiences that your family will love. Experience your own Griswold family vacation driving through Kansas on the trail of roadside oddities. Who can resist a wayside sign directing you to The World’s Largest Ball of Sisal Twine? While you’re at it, be sure to snap a picture of the kids next to the world’s largest prairie dog, spur, meat cleaver, and hand dug well. 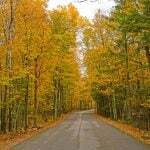 All are located along Kansas roadsides. If you happen to miss any of these world’s largest attractions, look out for Kansas’ mobile museum,World’s Largest Collection of World’s Smallest Versions of World’s Largest Things, that showcases them all in miniature. World’s largest things aren’t the only quirky attractions in Kansas. The state is also home to the infamous Kansas Barbed Wire Museum, where kids will learn some pioneer history and witness over 2,000 barbed wire varieties. In Lebanon, geography buffs can stand in the Geographical Center of the United States, and in Norton, political buffs can view pictures of every defeated U.S. presidential candidate at the They Also Ran Gallery. Enjoy Kansas quirkiness, a trait synonymous with original and peculiar, that is oh so lovable. Agriculture flourishes in Kansas where “amber waves of grain” (to paraphrase “America the Beautiful”) beget the American breadbasket. The perfect place to teach kids that supper doesn’t come from a big box grocery store is the Deanna Rose Children’s Farmstead. This turn-of-the-century farmstead preserves a way of life that many city-dwelling kids have yet to experience. The farmstead showcases a one-room schoolhouse, dairy barn, old-time fishing pond, and nearly 200 farm animals and birds of prey. 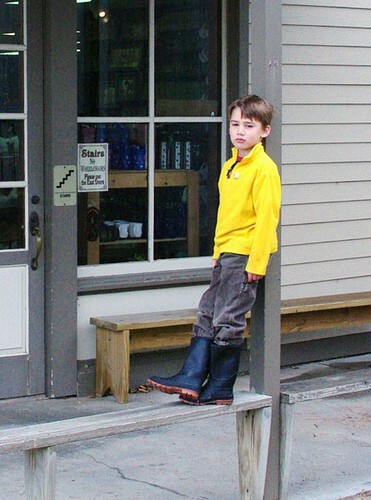 Kids are asked to help out with the farm chores by bottle-feeding baby goats and milking cows. 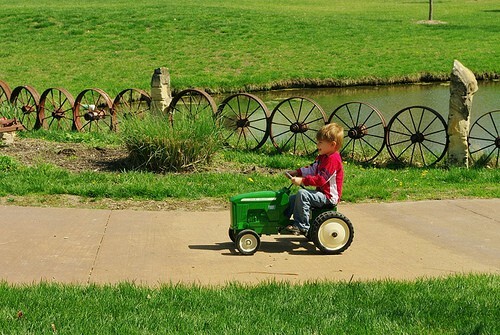 After finishing farm chores, kids can hop on a pony, ride in a wagon, fish in the pond, and race their own pedal tractor. Hitch up those wagons and head to the farm where kids can learn where the American breadbasket gets filled. Need a place to stay near the farm? Towering rocks and vast salt deposits aren’t the first thing you think of when considering Kansas landscape. 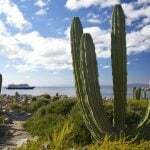 However, millions of years ago, the state was covered by an inland sea that evaporated, leaving behind geological wonders. Tunnel 650 feet below the Earth’s surface while visiting the Kansas Underground Salt Museum, where kids can touch remnants of an inland ocean. Then, hop on the Salt Mine Express underground train and ride through the Permian Playground where scientists have discovered the world’s oldest bacterial organism. 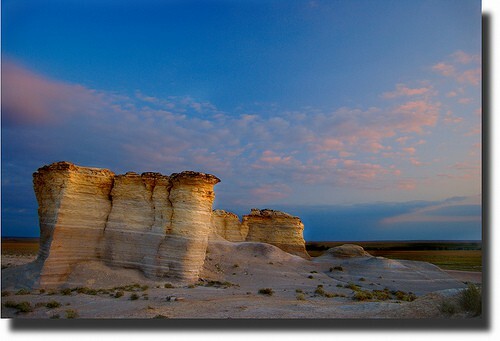 Above the Earth’s surface, the ancient sea left behind distinct rock monoliths of Dakota Sandstone, Niobrara Chalk, and Greenhorn Limestone dotted throughout the state. Explore the unique rock outcroppings at Rock City and Mushroom Rock State Park where kids will feel like they’re on another planet, or admire a landscape fit for an old western movie at Castle Rock Badlands and Monuments Rocks. Whether tunneling below or bouldering above, families will discover a geological playground in Kansas, courtesy of its ancient inland sea. Kansas boasts several top rated dinosaur museums and dinosaur related activities. Perhaps the most recognized is the Museum of World Treasures, home to the most complete T-Rex skeleton ever discovered, as well as an Edmontosaurus, Daspletosaurus, and a Thescelosaur. Just traveling through? Take a short stop and explore the Sternberg Museum of Natural History, a small museum focusing on fossil history. Or, check out The Fick Fossil Museum with its displays of locally-found fossils and the oldest documented Mosasaur skull. Take the kids on a dinosaur scavenger hunt at the University of Kansas Natural History Museum, where one of the most visited dinosaur exhibits in the state is located. 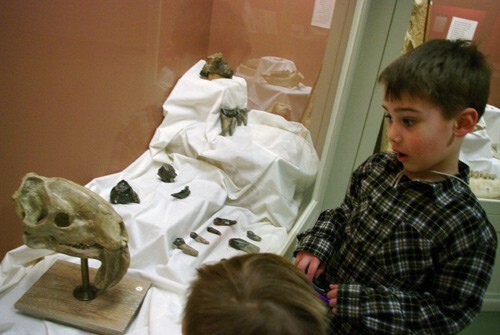 The best part about this museum is that kids can touch some of the fossilized bones! 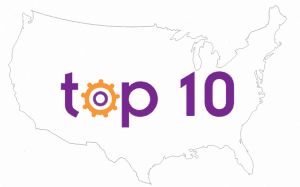 Kansas is home to several children’s museums offering plenty of indoor activities for those too-cold-to-go-outside days. Looking for some hands-on learning? 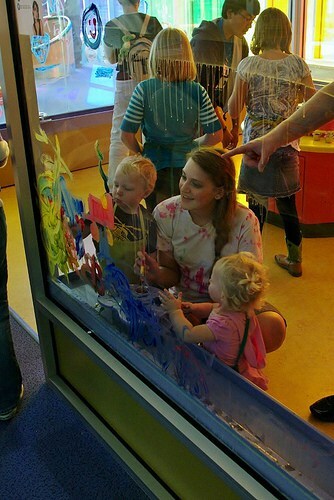 Kids can learn something new while playing at the Wonderscope Children’s Museum with imaginative activities at every turn. 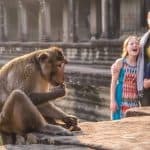 Are you ready to let the kids be in charge? 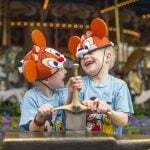 Look no further than the Exploration Place, where kids rule over their own kingdom in the museum’s medieval castle. This museum offers visitors a variety of traveling exhibits covering topics from the human body, imagination, to the world around us. Looking for some colorful fun? Check out the Kansas Children’s Discovery Center and its plethora of hands-on learning exhibits such as a kid-powered grain elevator, Kansas sunflower climber, and a new outdoor learning center. With so many wonderful indoor museums, your kids will be begging for more cold winter days. Tallgrass prairie once covered 170 million acres of North America. 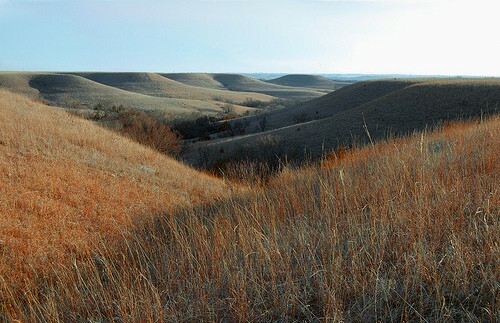 Now, a mere 4% of this grassland remains, with the largest tract preserved at the Tallgrass Prairie National Preserve in the Kansas Flint Hills. Here families can explore miles of trails through the enduring prairie and feel as if they’re floating on a sea of grass over rolling hills. Check out the interactive displays showcasing the area’s geological and anthropological history at the new Flint Hills Discovery Center, gateway to the Tallgrass Prairie National Preserve. If your family is in search of wildlife, take a prairie tour through the Maxwell Wildlife Refuge where preserved grassland supports an abundance of fauna, including the state’s largest population of bison and a herd of wintering elk. Much of the state’s prairie appears as it did hundreds of years ago, allowing nature loving families to step back in time and experience the splendor of natural Kansas. Want to spend more time in the prairie? Book a hotel stay. 4. Lions, and tigers, and bears! Oh my! At last count, Kansas was home to 19 zoos, each offering a unique animal experience. Topeka Zoo houses a tropical rainforest with free roaming animals and a children’s zoo with plenty of domestic critters to pet and feed. Sedgwick County Zoo offers kids a biological glimpse inside 5 continents with its 2,500 animals. The K-State University Insect Zoo features creepy crawly critters and is sure to be a kiddo pleaser. Sunset Zoo exhibits exotic and endangered animals, and strives to attain its mission “to inspire conservation of the natural world” through international conservation projects. Rolling Hills Wildlife Adventure offers a 65 acre zoo and a wildlife museum where kids will experience an imaginary journey observing animals around the world. Lee Richardson Zoo is a 50 acre oasis in the plains and offers free admission for pedestrians. 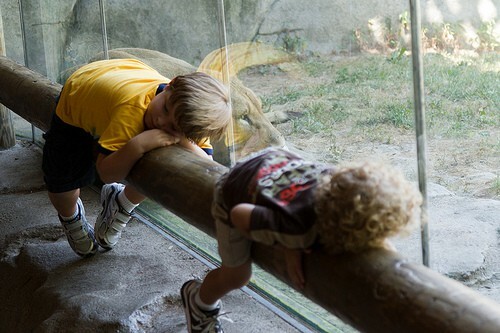 Take a walk on the wild side while exploring one of the many zoos in Kansas. What do you love about your favorite Kansas zoo? Share your scoop with Trekaroo. Space, the final frontier, is alive and well at the Kansas Cosmosphere and Space Center which showcases a U.S. space collection second only to the Smithsonian Air and Space Museum, along with the largest collection of Russian space artifacts outside of Moscow. 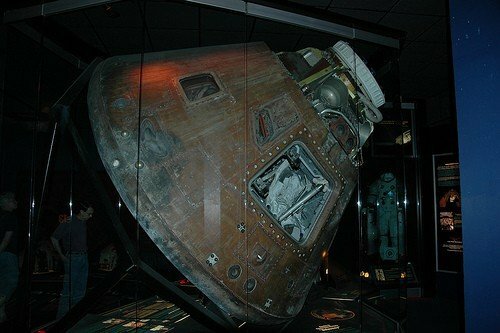 Plan to spend the day discovering artifacts spanning U.S. and Russian Space Exploration including the actual Apollo 13 command module, Liberty Bell 7 Mercury capsule, and a flown Vostok spacecraft. 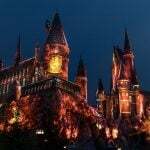 Kids will enjoy a show at the Hubble IMAX movie theater, watching a live demonstration about rocketry and elementary physics at Dr. Goddard’s lab, and a planetarium show. Looking for summer camp opportunities? Space camp experiences are available for kids in grades 2-12, as well as intergenerational camp offerings. Hey kids! Grab your boots and hats, don your spurs and holster, and head to the Wild West in Kansas. Dodge City, the wildest, wickedest, and woolliest “Queen of the Cowtowns” was a buffalo hunter central, a Santa Fe Railroad stop, and a major point along the Western Cattle Trail. Today, this wicked and wooly town invites families to explore the Wild West while meandering along the Dodge City Trail of Fame, a walking tour of the Dodge City historic district. Relive the old western legends while visiting the Boot Hill Museum, located on the original site of some gunslinger graves at the infamous Boot Hill Cemetery. In Wichita, stop by the Old Cowtown Museum where kids will discover what it was like to live during the 1870’s. Visit the home of the town’s founder, watch a blacksmith, and enjoy a wagon ride. Just be ready to run for cover since gunfire occasionally erupts in the streets! See what family’s love about Dodge City. “Toto, I’ve a feeling we’re not in Kansas anymore,” is an unforgettable line from The Wizard of Oz. In Kansas, you actually don’t need to be picked up by a tornado to visit Oz. Instead, drive The Road to Oz, located in Wagemo, to visit the Oz Museum, which houses movie memorabilia along with artifacts, history, folk art, and collectibles. Haven’t you always wondered what happened to those terrifying flying monkeys? In October, the town hosts the annual Oztoberfest where families can meet some of the original Munchkin cast, take a Yellow Brick Road bike ride, and join in on Oz family fun. 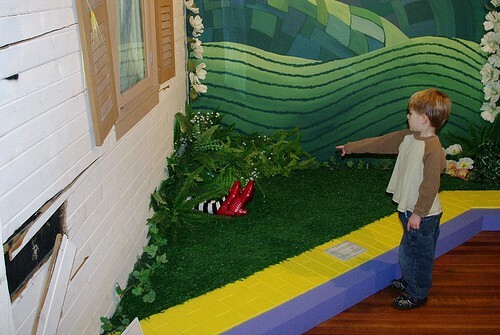 The Land of Oz can also be found in Southwest Kansas where visitors will discover “there’s no place like home” while touring Dorothy’s house, a replicated version of the infamous farm house from the movie. Close your eyes and tap your heels 3 times, but only after you follow the Yellow Brick Road through Kansas. I want to run through that tallgrass prairie like Laura Ingalls Wilder SO bad! 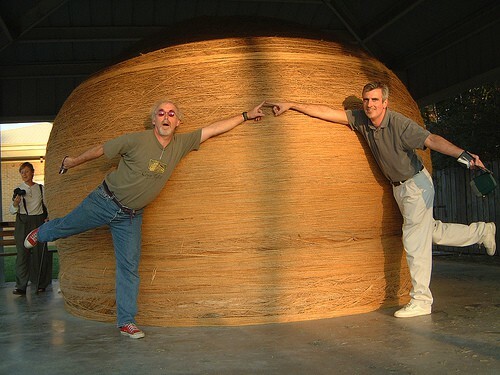 Then I want to see that ball of twine. Two great things to check off the list indeed! While you’re visiting the World’s Largest Collection of World’s Smallest Versions of World’s Largest Things in quirky Lucas, Kansas, also see the Garden of Eden and the Grassroots Art Center. Lucas also has a new public restroom at Bowl Plaza that is unlike any you’ve ever seen before. Thanks for sharing those ideas Shauna. Lucas sounds like a fun and quirkly place to visit.